ASU hockey is NCAA Tournament-bound for the first time ever. In just its third full season at the NCAA level, the Arizona State Sun Devils hockey team is going dancing. ASU learned Sunday that it was one of 16 teams selected for the 20199 NCAA Tournament. The Sun Devils are a No. 3 seed and will face No. 2 seed Quinnipiac on Saturday at 4:30 p.m. Arizona time in Allentown, Pennsylvania. 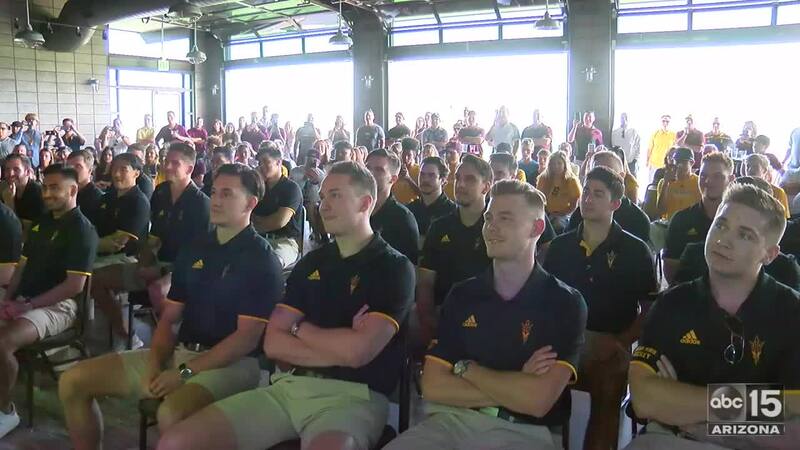 The team watched the selection show at the Papago Golf Course on Sunday afternoon. Under ninth-year head coach and former ASU goaltender Greg Powers, the Sun Devils have gone from a mediocre club-hockey program to an NCAA powerhouse. The Devils posted a 21-10-1 record in 2018-19 after failing to win more than 10 games in each of their first three seasons at the NCAA level. ASU is the quickest hockey program to advance to the NCAA Tournament after gaining status as an NCAA program, breaking Penn State's record by one year. The Devils don't belong to an NCAA conference; they became the first independent program to advance to the NCAA Tournament since 1991-92.